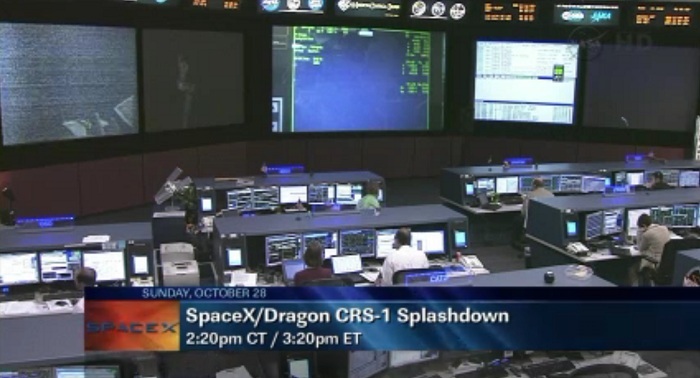 Blick auf ersten Dragon-Splashdown, welcher morgen CRS-1 vollführen wird. 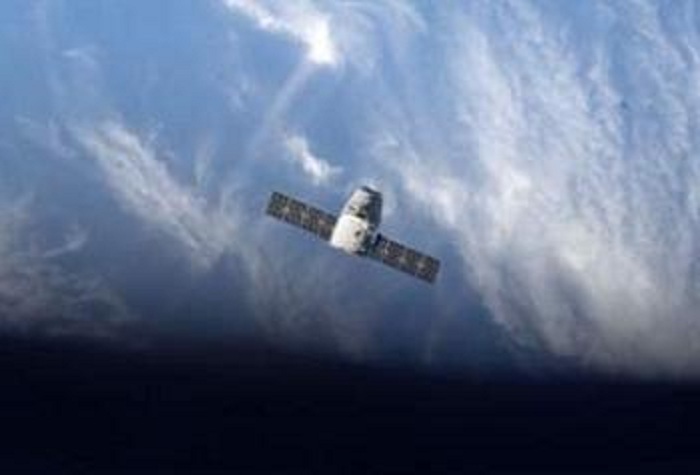 In California, SpaceX crew have already headed to the Pacific Ocean splashdown zone to await Dragon’s arrival, while at the station, Expedition 33 crew members are readying Dragon’s return cargo, including biological samples that have been stored in the station’s freezers since the retirement of the space shuttle. 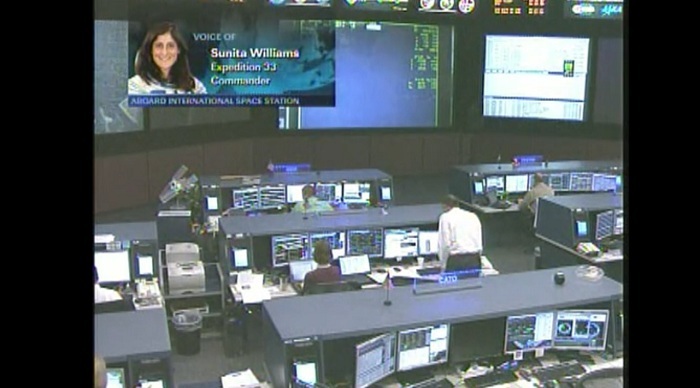 The crew’s first task on Sunday will be to depressurize the vestibule between Dragon and the station so that the spacecraft can be released. 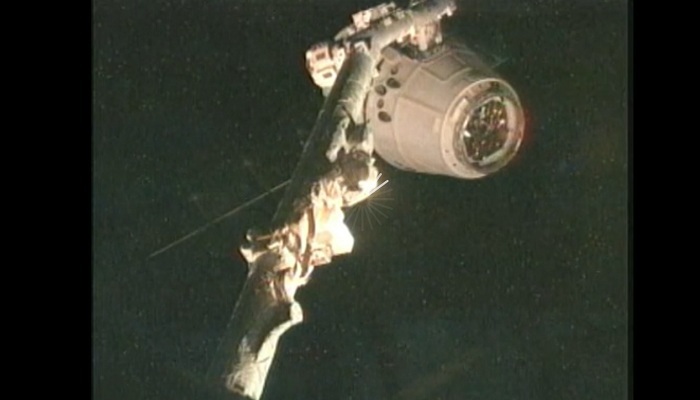 The spacecraft will then be detached from the space station and eased out to release position by way of the station’s robotic arm. 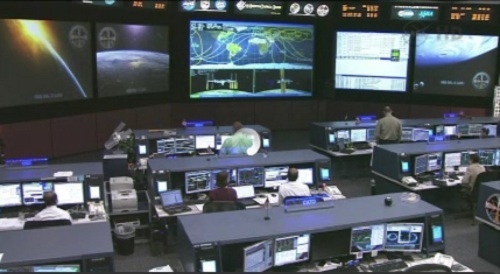 When the station astronauts are ready, SpaceX gives a go, NASA gives a go, and the crew releases Dragon, expected to take place at approximately 6:25 a.m. PT Sunday. 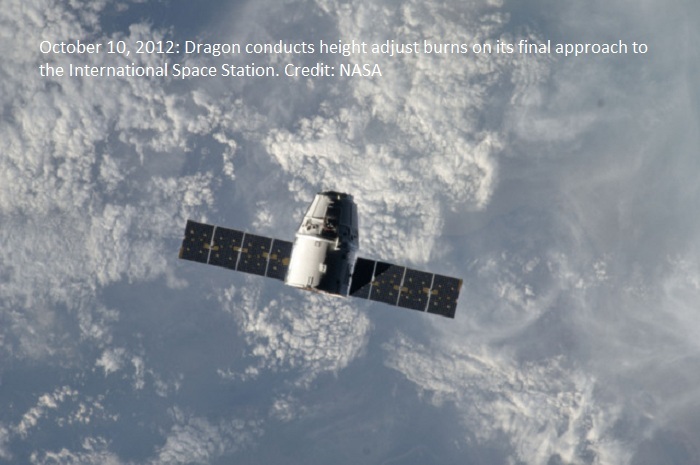 Dragon then begins a series of thruster firings to carry it away from the space station, closes its GNC door, and begins its deorbit burn. 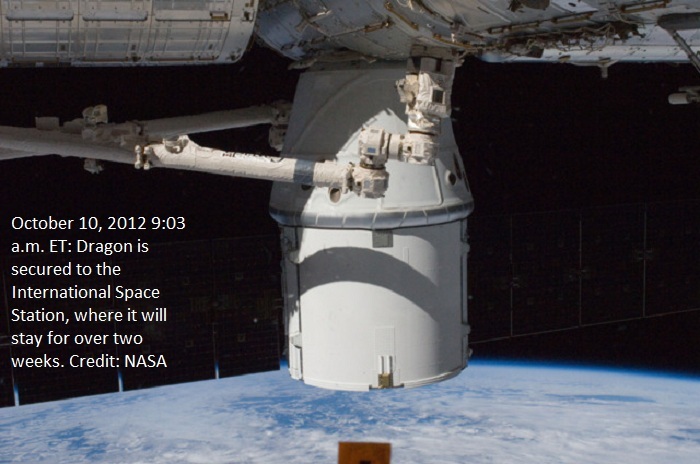 Ready to reenter the atmosphere, Dragon jettisons its trunk and solar arrays, positions itself so that its PICA-X heat shield faces the Earth, and proceeds into the Earth’s atmosphere. 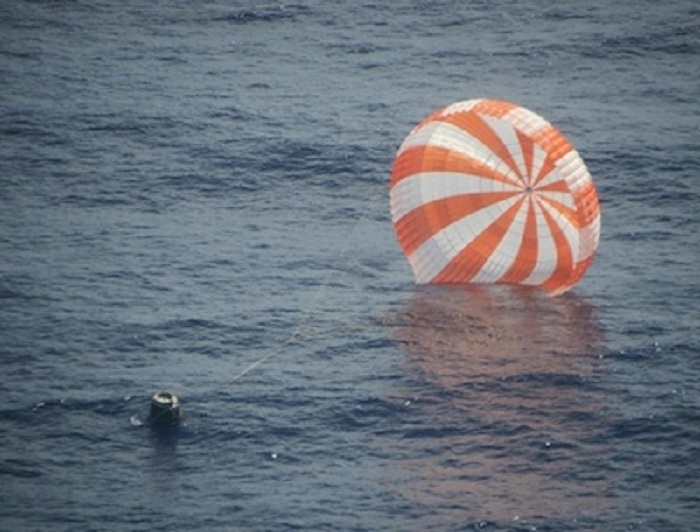 When Dragon reaches 13,700 meters (45,000 feet) above sea level, it will deploy two drogue parachutes to slow its descent. 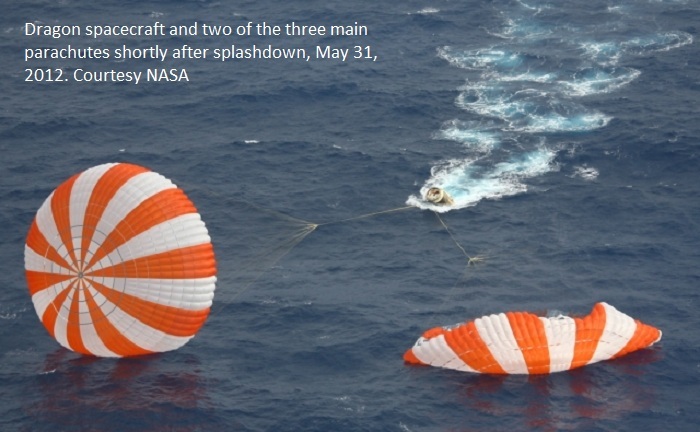 At 3,000 meters (10,000 feet), it will deploy its three main parachutes and drift slowly toward the splashdown site. 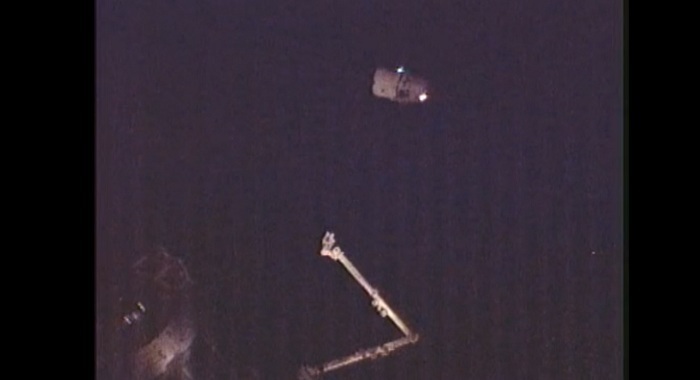 Splashdown is expected to take place at approximately 12:20 p.m. PT. 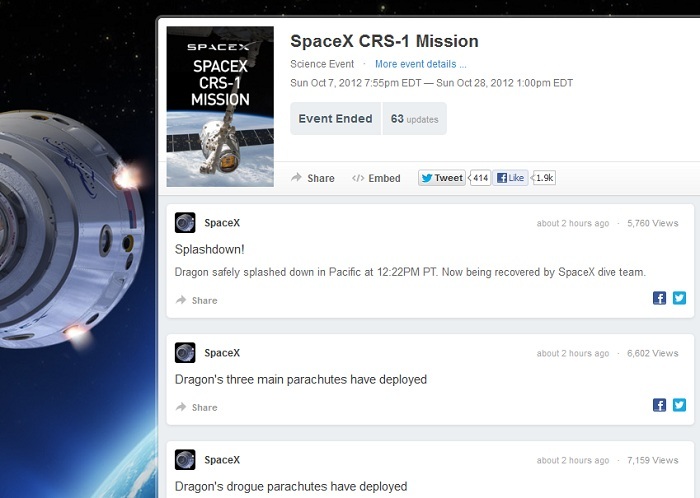 After Dragon is secured, the SpaceX team will then place the vehicle on the deck of a 100-foot boat for the journey back to shore. 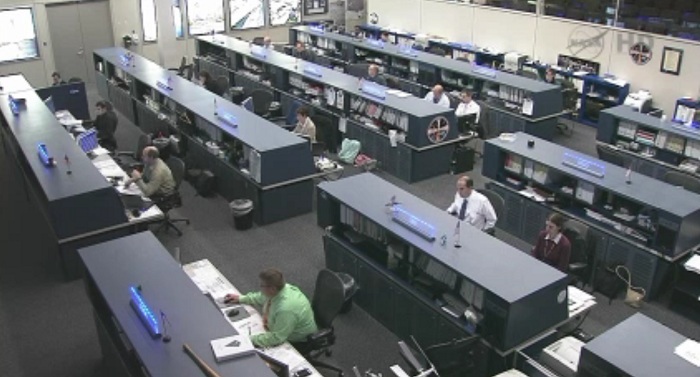 Early-arrival cargo will be delivered to NASA within 48 hours of splashdown. 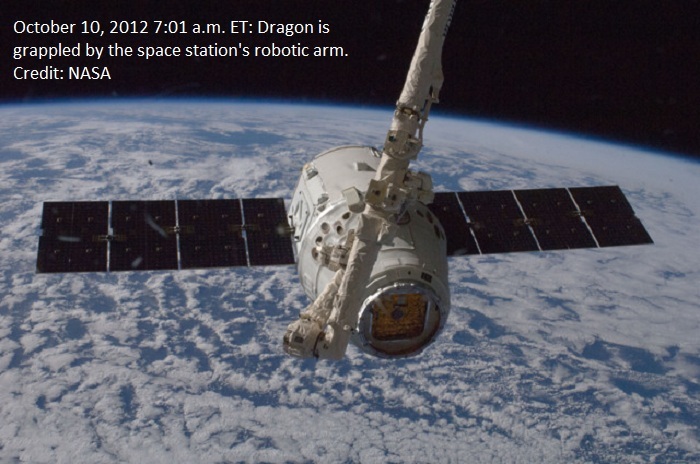 Dragon will then travel from Southern California to SpaceX’s facility in McGregor, Texas, where the remaining cargo will be unloaded, processed, and delivered to NASA. 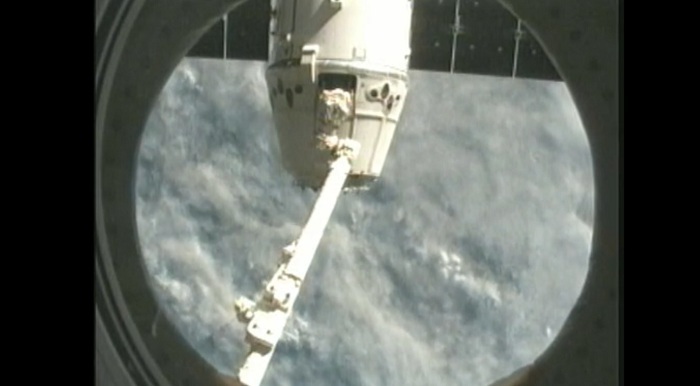 The SpaceX Dragon cargo craft spashed down in the Pacific Ocean at 3:22 p.m. EDT Sunday about 250 miles off the coast of Baja California, marking a successful conclusion to the first contracted resupply mission to the International Space Station. 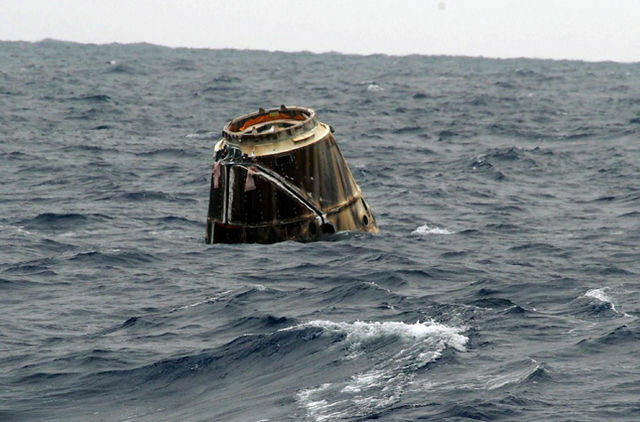 After Dragon is secured, the SpaceX team will then place the vehicle on the deck of a 100-foot boat for the journey back to shore. 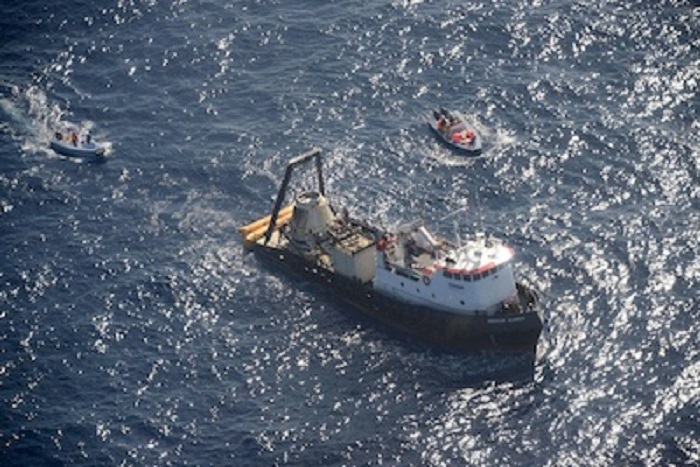 Early-arrival cargo will be delivered to NASA within 48 hours of splashdown. 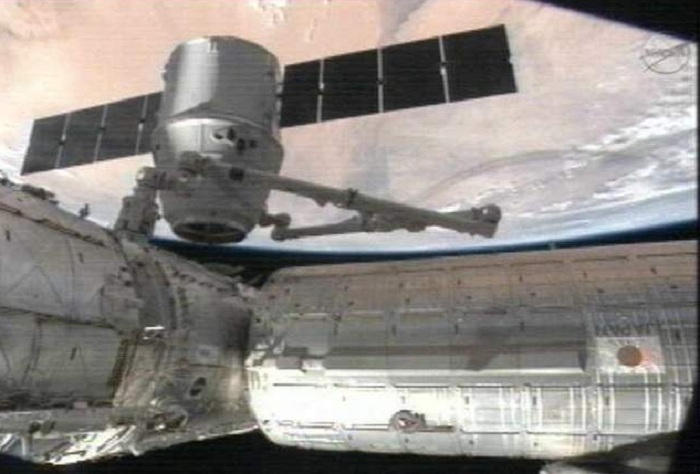 Dragon will then travel from Southern California to SpaceX’s facility in McGregor, Texas, where the remaining cargo will be unloaded, processed and delivered to NASA. 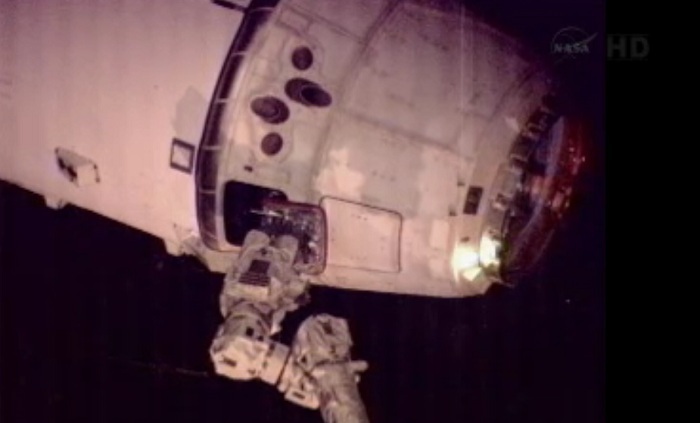 The ground team at Mission Control Houston remotely commanded the station’s robotic arm to uninstall Dragon from the Earth-facing port of the Harmony node at 7:19 a.m. after Expedition 33 Commander Suni Williams removed the bolts and latches of the Common Berthing Mechanism that had secured the cargo craft to the station since Oct 10. 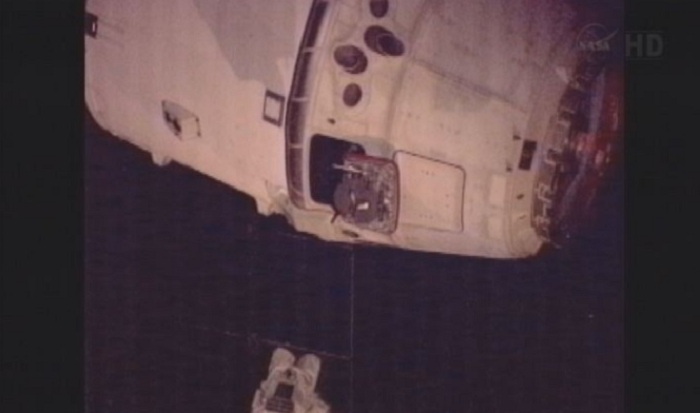 A set of programmed commands to Canadarm2 then maneuvered Dragon out to the 15-meter release point, where Williams and Flight Engineer Aki Hoshide ungrappled Dragon at 9:29 a.m. and backed the arm away.